A selection of quality children’s books about the solar system and a collection of high quality manipulatives allow children to extend a scientific inquiry on space into other areas of study including language arts, reading, math, and social studies. 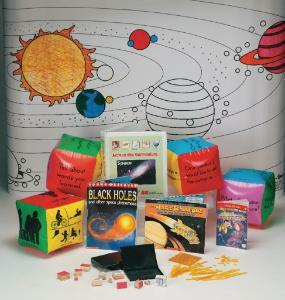 The three book series, inspires a variety of activities involving space. Using the books in combination with the included manipulatives will translate a lesson on space exploration into a number of different subject areas. Includes materials for 25 students. Developed by Tammy Finnerty, Noreen Roberts, and Kimberly Texter. Books included with the kit are also available separately. Grades 3–5.